I have read “Steps to Complete ID” below. Steps to finish ID will be emailed to me. 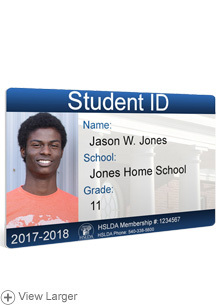 Exclusively for HSLDA members, our Student ID cards can be used to professionally communicate student status, and to obtain student discounts. Families living in states with daytime curfew laws may find this Student Photo ID particularly helpful as it can be shown to government officials who request student identification. The school year currently being printed on the Student Photo IDs is 2018-2019. From Anonymous of Irvine, California on 10/22/2018 . From Henry Ramelli of Valley Center, California on 9/24/2018 . From Aubrey Eaves of Monterey, Tennessee on 9/17/2018 . From Anonymous of Chester, Virginia on 9/6/2018 . From Chad Rodgers of Victorville, California on 9/4/2018 . From Anonymous of Spokane, Washington on 8/27/2018 . From Anonymous of Roswell, New Mexico on 8/4/2018 . 4/7/2015 – When will you begin printing 2015-2016 on the student photo IDs? 1. Add this product to your cart and check out. Check your email address for accuracy when placing your order. After your order has been submitted you will receive an order confirmation email with a link to our Photo ID creation page. Follow the link in the email to begin creating your ID. 2. Enter your HSLDA membership number, Last Name, and Order Number to login to the photo ID creation page. Follow the prompts to complete and submit your ID(s). 3. You have 30 days to complete and submit your Photo ID. Orders not completed within 30 days will automatically become a non-tax-deductible donation to HSLDA. *Please note that any other product ordered along with your ID will be shipped at the same time as your ID. Text that specifies your student is homeschooled under state or private school law.